Motorola has started rolling out Android Nougat for Moto Z Play in India. The build is NPN25.137-15-2. Multi-window view: Android Nougat supports a multi-window view so you can run two apps side by side in your screen. For example, reply to a text message while watching a video, or browse the internet during a video call. Activate multi-window view by long-pressing the overview/recent apps button while in a compatible app. Important: the developer of the app needs to enable multi-window view. Data saver: Data saver helps reduce cellular data usage. When Data saver is on, apps running in the background won't be able to access cellular data. An app you're currently using can access data, but may do so less frequently. You can also choose which apps have unrestricted cellular data access. To turn Data saver on, open Settings from the app tray and go to "Data usage," then tap on "Data Saver." To adjust data access for individual apps, got to "Unrestricted data access." Doze on the Go: Android Nougat comes with an improved Doze mode. Now your device goes into lower power usage when you are not using it, and the screen is off, even if you're on the move. Just-in-time compiler: The new just-in-time compiler improves runtime device performance, helps reduce the amount of storage space required for apps, and helps make app and system updates much faster. Notification direct reply: Android Nougat lets you quickly reply to messages right from the notifications. When you receive a message, swipe the status bar down and tap "Reply" on the message notification. Then type and send your response, all without opening the app. Works on compatible applications. Bundled notifications: Get more information at a glance! In Android Nougat, multiple notifications from the same app are bundled together into a single notification group. Drag the status bar down and tap the group to expand it and see or take action on individual notifications. Notification controls: You now have more control over notifications. Just press and hold on a notification to toggle the settings. You can silence or block future alerts from an app in the notification itself. Custom quick settings: Android Nougat lets you rearrange the quick setting tiles, so you can find your commonly used settings faster. Just swipe the status bar down with two fingers, then tap "Edit" at the bottom of the quick settings panel. Quick settings bar: A new settings bar was added at the top of the notification shade, so you can conveniently access your quick settings when reading your alerts. Settings suggestions: Android Nougat gives you meaningful suggestions for how to get more out of your device. Find them at the top of the Settings menu. Lock screen wallpaper: You can now have different wallpapers on your phone's homescreen and lockscreen. To set the wallpapers, long-press on an empty space in your home screen, then tap "Wallpapers". Once you select an image, tap "Set wallpaper" at the top of the screen, you will be prompted to set the selected wallpaper for the home screen, lock screen or both. Improved system backup coverage: Android backup covers more device settings in Android Nougat, including accessibility settings, run-time permissions for apps, Wi-Fi hotspot settings and Wi-Fi network restrictions. New and updated emoji: Do you speak fluent Emoji? Bring your words to life with all-new emoji, including redesigned human emoji with multiple skin tones. Emergency information: Emergency Information lets you add information such as name, blood type, allergies, and an emergency contact so that emergency responders can view this information through your device's lock screen. To add or edit emergency information, open Settings from the app tray, scroll down to "Users", then tap on "Emergency information". Accessibility settings in initial setup: Now you can configure accessibility features for your phone during the setup tutorial. Set magnification gesture, font size, display size, and TalkBack right out of the box. Accessibility mono output: Assists users with hearing loss in one ear by combining stereo left and right channel output to a single mono stream. To turn Mono Audio on, open Settings from the app tray, then go to "Accessibility" and scroll down until you find the "Mono audio" switch. Variable text to speech: Allows setting a wider range for speech rate and pitch. Open Settings from the app tray, then go to "Accessibility" and scroll down to "Text-to-speech output". Use the sliders to adjust the speech rate and pitch. Size of display elements: In Android Nougat not only can you change the font size, but also the size of the display elements, like icons and images. To adjust the size of your display elements, open Settings from the app tray and tap "Display," then scroll down and select "Display size." Trusted face improvements: Unlocking your phone with Trusted face is easier than ever. Trusted face, a part of Smart Lock, has new facial recognition, which is less sensitive to conditions like lighting, facial decorations and how you hold your phone. Call Screening: Allows the default phone app to screen/block incoming calls. To set call screening, open the default dialer app, tap the menu icon at the top right corner (3 vertical dots) and select "Settings," then go to "Call blocking". Multi locale language support and preferences: Now you can add multiple languages in your device settings to customize experiences for you, like showing search results in multiple languages and not offering to translate webpages in a language you already know. You can even sort your language preferences so that apps can pick the right keyboard & text for you. Locales by language: We added the option to select locales for commonly used languages. When you add a new language, you will be prompted to select the locale (if supported for the selected language). 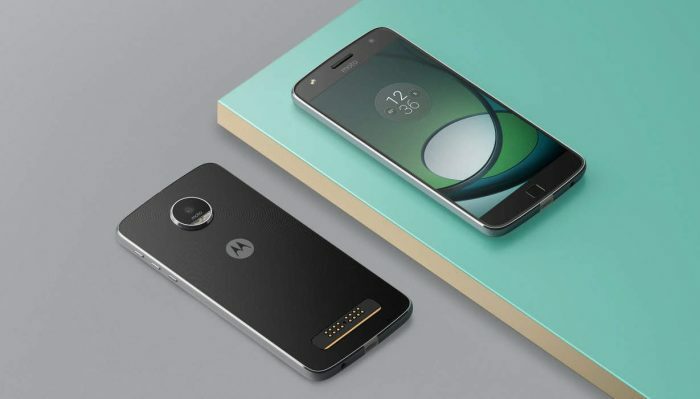 Moto Display landscape mode: Now you can use Moto Display in landscape view when your phone is connected to a Moto Mod™. Hasselblad TrueZoom mode settings: Your phone will now remember the mode that you selected the last time you used your Hasselblad TrueZoom Moto Mod™, instead of returning to the default JPEG mode every time you turn it on. Hasselblad TrueZoom improvements: Includes performance improvements for the Hasselblad TrueZoom Moto Mod™. Important: in addition, you must update the software of your Hasselblad TrueZoom Moto Mod™ to receive these improvements. “Swipe to shrink the screen” enhancement: now it’s even easier to use the phone with one hand. The smaller screen will be placed on the side you swipe to. To know more about this action, open the Moto app, then go to Actions > Swipe to shrink the screen and follow the tutorial. Fingerprint sensor for screen lock: We added a new setting to disable and enable locking the screen when the screen is on, and you touch the fingerprint sensor. To access this setting, open Settings from the app tray, scroll down to "Security," then tap on the screen lock gear icon.